*Please note that this policy does NOT apply to fishing charters, private charters, group reservations, and Scuba Certification Courses. (Please read the "Tour Specific" or "Group Reservations" Cancellation policies below). If you cancel within 7 Days of your scheduled activity, you forfeit the deposit paid. It will be held as a credit to your account good for up to one year. You can use it for future reservations at any of our locations in Mexico, the Caribbean, and the Florida Keys. If you made a payment in full you will be refunded 75% of the total amount paid. If you cancel within 3 Days of your activity date, you will be billed the remaining balance as per the credit card authorization detailed below (if only the deposit was paid). No credit will be issued. If you cancel within 7 Days prior to your activity taking place, you will be billed the remaining balance as per the credit card authorization detailed below(if only the deposit was paid). No credit will be issued. Please call our office to inform us if your reservation is canceled for the following reason. If Your Cruise Ship Itinerary Changes If your cruise ship changes itinerary and prevents you from participating in your excursion, you will be issued a full refund. You will need to provide us proof of this itinerary change before we can authorize a refund. If Your Airline Itinerary Changes If your airline cancels your flight or is delayed and prevents you from participating in your excursion, you will be issued a full refund. You will need to provide us proof of this itinerary change before we can authorize a refund. Your Final Confirmation Voucher All reservation holders will be emailed a final confirmation to the email provided when making the reservation within 24 hours. You are responsible to make sure the email you provide is valid and that you have received the final confirmation. You must contact our office if you have not received your confirmation with 24 hours of making your reservation. This confirmation will contain all the details concerning your activities including, times, locations, amounts charged and amounts owed. You are required to bring this with you and present the confirmation on the day of your activity. Cruise Ship Customer Port Times Please make sure your itinerary time and local times are the same. Some cruise lines use "ship time" for their port times instead of the actual local time of the port you'll be visiting. If you are late or do not arrive on time because you did not schedule your activity accordingly, you will still be held financially liable. No Shows If you or a member of your party do not show up for your activity, you will be responsible for the total amount of the tour, this includes being charged any remaining balance that is due. Showing Up Late If you or a member of your party show up late, and are not able to participate, you will still be responsible for the total amount of the activity, including any remaining balance that is due. 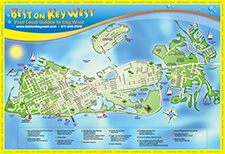 Any financial remedy is the responsibility of the activity operator and NOT "BestOnKeyWest.com, Inc." No refund will be given for any cancellations or no-shows as a result of you failing to follow the instructions on the confirmation. Credit Card Disputes & Charge backs: You agree to contact and speak to our office via telephone directly to resolve any discrepancy before initiating a dispute or charge-back with your credit card company. If you fail to contact our office before initiating a charge-back you will waive your right to file a dispute and you authorize "BestonKeywest.com, Inc." to charge a $25 Administrative fee to your bank or credit card.